Successfully Added ECT Kenjoy Vot Mini Tank - 50W, 0.3 - 0.5 Ohm, 510 Thread, Adjustable Air Flow, Rebuildable Design, Double Nozzle Structure to your Shopping Cart. Upgrade your current vape mod set and take your vaping experience to the next level with the ECT Kenjoy Vot Mini Tank. This beautiful vapor atomizer has been crafted out of durable stainless steel and features a high-quality borosilicate glass tank. 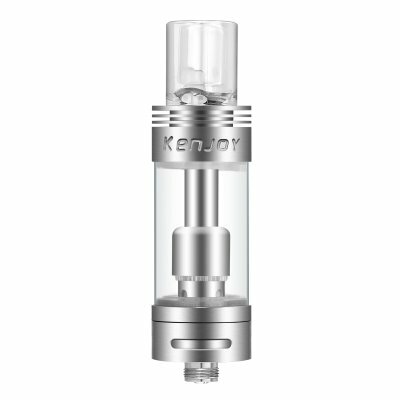 With its rebuildable structure, the Kenjoy Vot Mini Tank is easy to clean and allows you to replace separate parts whenever necessary. Built to deliver a high performance, great taste, and massive vapor clouds – this E-cigarette atomizer is a vaper upgrade that allows you to take the absolute most out of your upcoming vaping sessions. Thanks to its unique double nozzle structure, the ECT Kenjoy Vot Mini Tank supports fast heat dissipation. Featuring tiny holes in the bottom of its design, this atomizer allows free gas transfer and supports emission of heat. Thanks to this, the atomizer gains great control over the volume of vapor created and additionally assures that you won’t experience a burning sensation in your throat while enjoying your electronic cigarette. Simply fill up its 2.5ml tank with your favorite taste of e-liquid and this bottom filling tank allows you to enjoy multiple relaxing and tasteful vaping sessions without needing to worry about running out of juice. Featuring a resistance of 0.3 to 0.5-Ohm, the ECT Kenjoy Vot Mini Tank supports the creation of exceptionally large vapor clouds that are sure to grab the attention of all your friends and people standing by. Added to that, this rebuildable atomizer features adjustable airflow - letting you adjust its settings to your own personal liking and assuring you’ll fully enjoy the delicious taste and vapor created by this little vape accessory. Additionally, the ECT Kenjoy Vot Mini Tank comes with a 510 threat connection that provides you with countless of possibilities to further enhance your vaping experience. Perfect for all of those who like to upgrade their current vape mod kit, this powerful atomizer provides you with all means necessary to take your upcoming vaping sessions to the next level. The ECT Kenjoy Vot Mini Tank comes with a 12 months warranty, brought to you by the leader in electronic devices as well as wholesale electronic gadgets..
Arabic: - رذاذ السجائر الإلكترونية - Chinese Simplified: - 电子烟雾化器 - Czech: - Atomizér elektronické cigarety - Dutch: - elektronische sigaret verstuiver - French: - Atomiseur de la Cigarette électronique - German: - elektronische Zigarette-Zerstäuber - Hebrew: - atomizer ב סיגריה אלקטרונית - Hindi: - इलेक्ट्रॉनिक सिगरेट हाथ की पिचकारी - Hungarian: - elektronikus cigaretta porlasztó - Italian: - Atomizzatore sigaretta elettronica - Japanese: - 電子タバコアトマイザー - Korean: - 전자 담배 분무기 - Malay: - pengabut Rokok Elektronik - Norwegian Bokmål: - elektronisk sigarett Atomizer - Romanian: - Atomizor tigara electronica - Russian: - Электронная сигарета распылитель - Spanish: - Atomizador cigarrillo electrónico - Thai: - ฉีดน้ำบุหรี่อิเล็กทรอนิกส์ - Turkish: - için Atomizer - Vietnamese: - Máy phun thuốc lá điện tử.